Any Event in Booking Live can have a Publish and an Unpublish date. This determines when an Event is visible for booking on the front end of the booking system. By default, Events are visible and bookable up to the moment the Event starts. Note: This can be changed to be the End time of the Event. 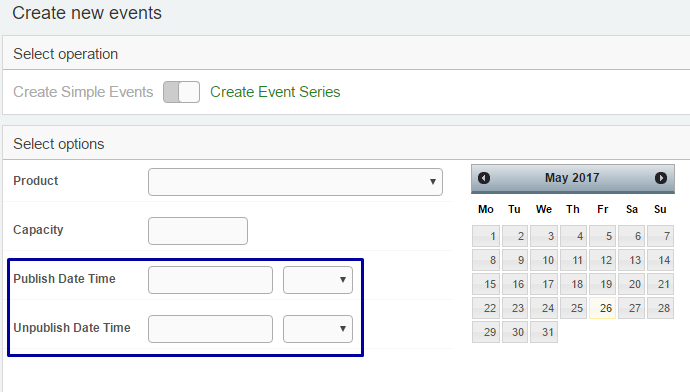 Utilising the Event Publish and Unpublish options, you can modify the appearance of an event on the front end of the booking system, either allowing or preventing bookings up to certain dates & times. 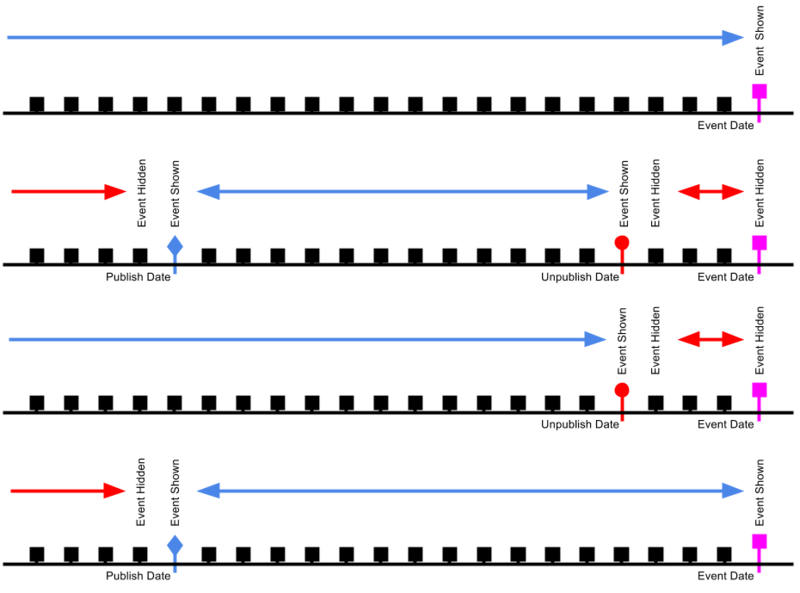 The Publish Date/Time is when the event becomes visible on the front end of the system. If this is used, then the event will not be visible any time before the established Date/Time. The Unpublish Date/Time is when the event stops being visible on the front end of the system. If this is used, then the event will be visible any time before the established Date/Time. Utilising both the Publish and Unpublish Date/Times allows you to have more control over the appearance and availability of your Events. 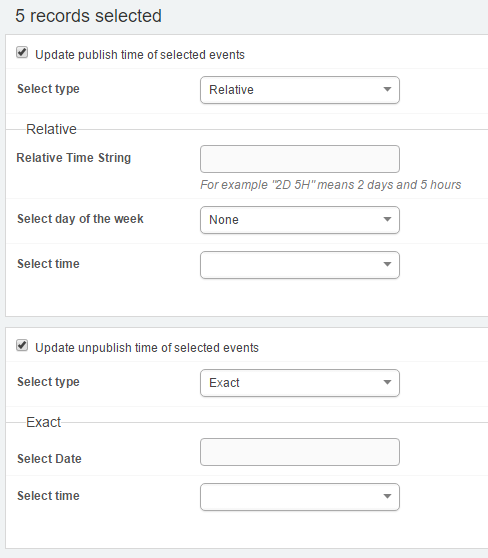 There are several different methods of being able to set up and modify the Publish and Unpublish date/times of an event. Find the event you want to edit, and slick on the icon. 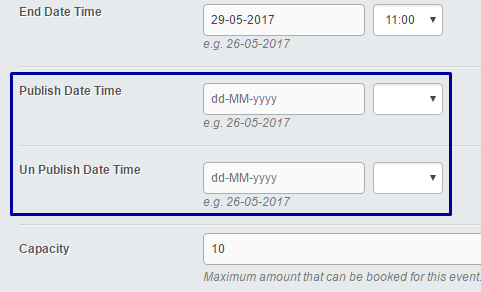 Enter dates and times as required in the Publish and Unpublish fields. Click " Save and Close"
Select the relevant options for Publishing or Unpublishing these events. When you are ready, click "Confirm" to finish the edit. Used to determine how the Publish or Unpublish dtaes will be selected. The date set will be relative to the Event Date. The date set will be a static date, irregardless of Event Date. When using Relative dates, you can define a Day of the Week. This wills et the date to be the next selected ay of the week after the Relative date. I.e if you set the Relative Date to be 3W and the Day of Week to be Tuesday, it will set the date to be the first Tuesday on/after 3 Weeks prior to the Event Date.